Pretty much as we expected, the first TAVISTOCK name has now started to appear on the former Park & Ride Enviros. First Enviro I have seen with 'Tavistock' names on the sides, expect from timetable changes these to move onto the 83/86s. Be interesting to see what First put onto the Park & Ride services. First PLYMOUTH next then ??? ...but funnily enough Citybus don't seem to want to join the commercial free for all compete against them with their own new E400s on the park and rides do they? Why would Citybus want to use their new buses on the Park & Ride? Clearly not enough passengers on it to compete for. They'll probably use the Enviros they tried to move elsewhere off the X80 service.Other than that the the crappy ones will be used,there's plenty to choose from. I just think First should invest in some new buses, rather than put any old crap on! Taking the newer buses off the P&R service isn't one of their better ideas! Almost as good? That's a matter of personal taste - I think the First ones are far more pleasing to travel on than the garish Blue Flash red interior ones! I guess it is down to personal taste - I find the first ones a bit dull - but otherwise they are decent buses. As for the ride I guess there is nothing between them. Certainly passengers will find both very acceptable. The free wifi is a useful extra but I am sure First could fit this to theirs quite easily if they wanted. As its being run commercially there is no tender to put out. If First decided not to run it anymore then I guess the Council would put a tender out to make sure it runs but otherwise its all done to First now. One of these 'ex' P&R Enviro 400s with First TAVISTOCK branding was on the 83 yesterday, so they definitely are destined for use on their Tavistock services. There will be no additional P & R buses for Bonfire Night or the late night Xmas shopping evenings. FDC appear not to feel it commercially worthwhile. Just wait and see. A new First Devon will launch on Monday in the city with lower fares and nicer buses, mark my words. First will hit the ground running on the 3a and 6 and have a lot more planned for 2014... extensions deep into other citybus estates across the city. Remember Citybus have really upset customers in Southway/Whitleigh etc with unreliable and cross linked services that nobody wanted. Next year it will be Go Ahead wandering if it is worth hanging around in the city, with massive losses and their shareholders will not put up with losses for years as First have. I see lots of drivers deserting Citybus for a resurgent First next year. Citybus have got a lot of old First managers repeating the same old mistakes that First made.. whilst First have a brand new management team who now have the backing from Aberdeen to restore themselves as the number 1 bus company in Plymouth... hence the really low fares. They are over 50% cheaper in Peverell, Pennycross, West Park, Honicknowle and Efford so should do very well in these areas... areas that Citybus have treated terribly for years. Nicer buses from Monday? So there's going to be a sudden overnight secret influx of new/newer buses is there??? As for the massive losses you predict for Citybus, it will take some going for the company to emulate FDC's multi-million pound annual losses. Anon @ 17:09 : Why the grudge against Citybus and Go-Ahead? Unfortunately, this guy's grudge and numerous pro-First/anti-Citybus postings are making it impossible for those of us outside Plymouth but with an interest in the area to gauge exactly what's happening. Ultimately, his postings with all the hyperbole and fanciful guesswork are not helping anyone, least of all First. I take it that none of the 'nicer buses' suddenly appeared this morning? What a surprise. Hopefully Graham will continue to provide his usual overviews and balanced analysis of the changing scene for those of us unable to see it for ourselves. It's Friday and havent seen the nicer buses you mentioned, perhaps you can tell me where I can see them! Well that clearly wasn't their consideration on Tavistock was it - there isn't enough business on the 83/86 to sustain two operators. My point on the park and ride is that it's another silly comment to talk about First putting their 'crappy' buses on the Park and Ride - does the commentator think that Citybus would put new E400s on the Park and Ride? No, so why should he/she think that First would leave theirs on it. Sorry - I see what you were getting at now! I also agree!! I think some of your readers live in cloud cuckoo land, First had a decent network which over the last decade they have cut back and back and back, this is repeated up and down the country, now your readers seem to think running a bargain basement service 6 and 3a will suddenly put first Devon back into a profitable company clearly need to take a step back and look at the bigger picture. Go-ahead on the other hand nationally go from strength to strength, I should imagine citybuses MD is not even bothered by first in Plymouth, more like a annoying fly in the room. I think we all know the likely outcome unless millions of people use the 6 (all paying a pound?!?!) then they will cancel the routes in 6 months just like they always do. remember the cheap 88 they launched when Citybus there 45 it was probably cancelled the day after they registered it it ran for such a short amount of time! Completely agree with this comment. Out of the big Groups First expect a higher return than the other bus companies. Devon and Cornwall are already a loss making company so they will need a very high number of passengers on each bus to break even let alone turn the company into a profitable one. Personally I can't see much hope for this company. Finally a sensible comment! It certainly doesn't appear as if Citybus is in the slightest bit rattled by First and if First continues to charge silly fares, they're going to struggle to just cover their costs let alone start turning a loss into a profit. Merely retaining their existing Torpoint and Tavistock passengers isn't going to do that either, especially with the inevitable loss of some of those passengers onto Citybus's new 12 and 32, even if it was only a few, it's still a reduction in revenue. First now seems to be using Devon and Somerset as some kind of experimental test bed for all those ideas that they didn't previously risk trying out in their more stable operations up country, so heaven help the poor staff and passengers if it all goes pear-shaped. I still find it completely unbelievable that Tim O'Toole actually stood up and said out-loud that South Devon was 'almost in closedown mode'. That was stupidity of Gerald Ratner proportions. What exactly did he think that would achieve? It was only ever going to give a green light to Stagecoach and Citybus to move in on the best routes, which is what exactly what happened. Go Ahead go from strength to strength. Except in Dorset, Hampshire, Wiltshire and in Suffolk obviously....! Go South Coast is only profitable because of the Isle of Wight monopoly- where they charge sky high fares, limber from crisis to crisis and are being run around by First in Southampton and Hedingham/Konect/Anglian limber from crisis to crisis. Brighton have had their first PI ever. Not quite sure of your assessment of the GSC operations. There is heavy investment in new buses recently so GA must think its worth investing in. First have not had things all their own way in Southampton - they introduced several new services against GA only to fairly quickly withdraw them. First are clearly also investing in Hampshire too so its another area to keep a close eye on over the coming year. "citybuses (sic) MD is not even bothered by first (sic) in Plymouth" ... well in cloud cuckoo land hasn't he already had a tantrum at First's managers in front of the council officers over them leaving Stagecoach alone while competing with his outfit??? how very true. citybus never ecpected first to fight back.and seem quite rattled. Yes very true he did. The poor guy thought he could trance all over Firsts' routes over the past few years, i'e Saltash, Torpoint, Ivybridge and Tavistock and First were just going to go 'there you go Go Ahead, have our customers'. But wait what cheek First start playing them at their own game and it;s cry to the council, well perhaps if he had not been so greedy and kept to his own patch this would not have happened? Now, First are ready for battle and from what I have bn told Citybus ain't seen nothing yet..wait til 2014.
also noticed on there new timetables first Devon and Cornwall empress road Southampton! i think that says a lot! ADmin will return to Plymouth in 2014. First know they got that wrong. The W reg PVL's have to stay dual door due to the layout of the staircase. On later models this layout changed, so there is less work to do when converting it, whereas the early PVL's would need a lot more work to convert, pushing up costs. The doors are removed to increase buggy space. Sorry but can't accept that explanation, if they were able to use buggy space in a far busy enviroment in london why can't that happen here? Is it because the people of plymouth can't accept dual door buses? I remeber when the first PVL's were introduced I went to the middle door to alight and was told by the driver to exit throught the front doors. if you cant accept it, that's up to you. but that is the reason why. Also the power ramps kept getting damaged by hitting the high kerbs. FACT. From what I have been told 8 new buses have arrived at First this week, going through checks and will appear on routes imminiently. Not heard anything from anyone else yet - anyone out there know? Citybus are trying to put First out of business which will result in hundreds of jobs lost and then increased fares to pay for this, as if their fares are not high enough.. so I can see why people may make anti Citybus comments, They are entitled to their opinion as are the swaves of First bashers out there. It wasnt that long ago that First were attacking Citybus so I can understand why Citybus are now fighting back. If the worst did happen and First pulled out then extra staff would be needed by Citybus - but yes jobs would be lost. It was not that long ago that top brass at First looked ready to pull the plug on the whole Devon operation so we are lucky they are still around and fighting back. There are plenty of First bashers - but plenty of Citybus bashers on this site too. It seems to me split fairly down the middle in terms of comments left but I will have a look back and see sometime. I am more than happy that this site has become an area people can express opinons - but just a gentle reminder - nothing personal against staff, no bad language, and try to be polite - no insults! Since I switched moderation on (for spam) I have only had to withold about 4 comments which is pretty good. Thanks everyone for this! The thing is, GSC have a large fleet and a high age profile, and in order to maintain a sensible age profile they need to replace 10 to 15% of the fleet annually. That's around 50 new buses per year. Witness the property sales in 2012, against the £6m investment in new stock. They have a monopoly on the Isle of Wight, which is used to prop up the rest of GSCs operations - the Alton College contract and the much heralded Dorset contract both lose money - Wilts & Dorset's main operation loses money on the core services, Bluestar hasn't turned a profit in 10 years. The 'more' core routes are heavily overbussed and use vehicles that return 4mpg - they can't cut those frequencies for fear of losing face to their rival in the area. On the secondary routes, they use the first generation 'more' Volvos, now 9 years old and not in the first flush of youth, and a coat of paint on the outside is deemed sufficient treatment for vehicles that have had a hard life. 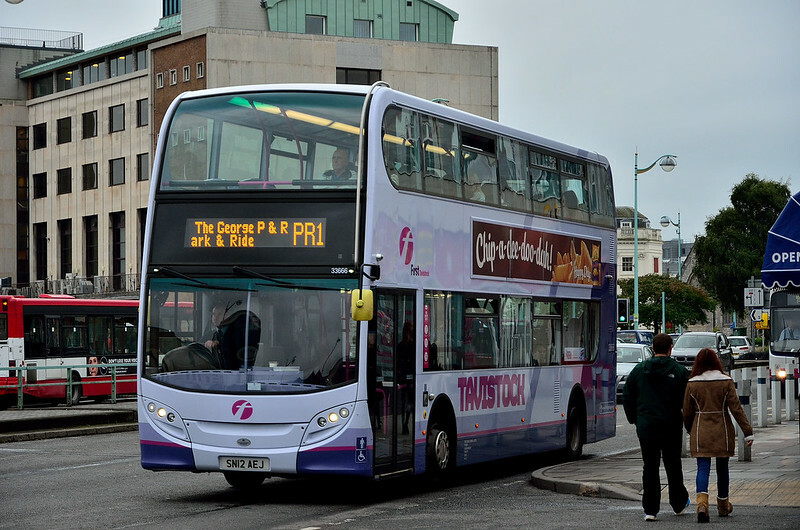 Go Ahead are fighting another bus war in Norfolk with two merged operations, against two independents and First - on top of arguing with First in Plymouth, Hampshire. There's a rumour First are going to expand from Weymouth into Dorset and recover the lost ground. On top of which. Western Greyhound is rumoured to be joining the Go-Ahead fold. It's worth remembering WG have an owner in his mid 60s, seeking to retire, and he's more than earned the right after a long career. But WG is a business with its own problems, an old fleet that isn't DDA compliant, a need to replace fire damaged buses and the retendering in Cornwall next year which will make for major issues for the new owner. Much of First's gains relate to the issues facing WG, with the cuts smokescreen being blamed for the contraction of the business. Just the diversion PCB (as the nearest neighbour who'd be given management control of WG) don't require as they take the fight to First. Richard Stevens has said in this weeks 'Route One' that he's planned for growth in buying new expensive double deckers. Strikes me Go Ahead have more to lose than First, who just have a debt pile and a need to buy newer buses. If First focused on the areas they have and grow them, like Stagecoach did at their crossroads period in the early 2000s they will be able to stay the course. First like large urban areas, where you can grow business on the corridors whereas rural areas are thinner in population terms and costlier to operate in. I wonder if First's new 6 route with its cheap fares, in the heart of PCB territory will prosper and need bigger buses. Diverting new buses in en masse has been done before, and can be done again if needs be.